“Your Beer. Your Label.” For a limited time a Newcastle Brown Ale microsite includes an application allowing visitors to create their own personalized beer labels. Final concepts are also added to an online gallery for fans to vote for their favorite design. Back in Brown. Speaking of labels, Dundee is putting the 1994 label back on its Original Honey Brown. They are also lowering the price and billing this as a return to the beer’s roots. Canadian Airport Beer Guide. The press release suggests this is “just in time for St. Patrick’s Day.” Whatever, Cheapflights.ca has compiled a “Canadian Beer Lover’s Airport Guide” that makes a good companion to the U.S. airport guide Cheapflights.com already offers. Step right up. 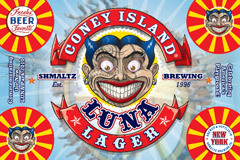 Coney Island Craft Lagers (Shmaltz Brewing Co.) has announced it will release a beer called Luna Lager to commemorate the launch of the new Luna Park 2010 on Coney Island. Based on the original Luna Park (1903-1946), one of Coney Island’s four historic amusement parks, the park – operated by Zamperla USA – is due to open Memorial Day weekend. Great Divide Brewing Company is adding Hoss Rye Lager and Claymore Scotch Ale to its year-round line up of beers. The beers were both intended to be seasonals when released in 2009. They will be joined by two returning seasonals, Espresso Oak Aged Yeti Imperial Stout and Colette Farmhouse Ale. Colette Farmhouse Ale is a renamed version of Great Divide’s Saison, available only in 22-ounce bottles last year. I wish more of the Canadian Airports served beers like the Montreal or Maritime ones!